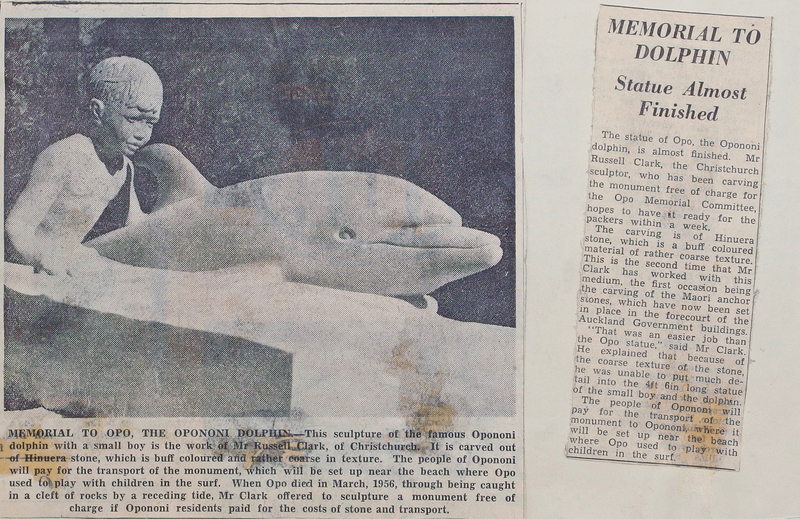 The glass artist John Hutton was on the list of New Zealanders living abroad that my editor at the Christchurch, NZ Press handed me when I left the paper in 1962. 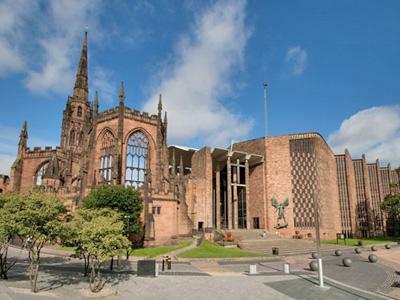 “He’s been working for years on a project for the new Coventry Cathedral. Go check out how it’s going,” he said. Also known as St. Michaels, the original cathedral in Coventry, England was constructed between the late 14th and early 15th centuries. It was gutted by incendiary bombs during World War II; only the tower, spire, the outer wall and the bronze effigy and tomb of its first bishop survived. After the war, a decision was made to build a new cathedral and to preserve the ruins as a constant reminder of conflict, the need for reconciliation, and the enduring search for peace. The architect, Sir Basil Spence, proposed that the new cathedral should be built alongside the ruins, the two buildings together effectively forming one church. St. Michaels Cathedral, Coventry, England. The old and the new side by side. 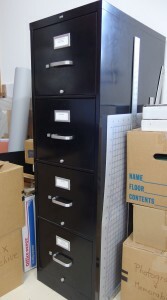 Spence commissioned many magnificent art works for the new modernist building. 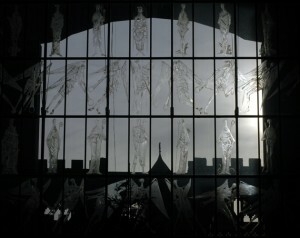 Hutton’s contribution was to be a great glass screen for the west end of the new cathedral. One of the vases made by Hutton for sale at Coventry Cathedral. It is decorated with figures which appear among the images in the Great West Screen. It is now in the University of Warwick Art Collection. Another artistic experience of a quite different sort was on Monday – we went out to interview John Hutton, a New Zealand artist who has made the great glass screen for Coventry Cathedral, which is to be consecrated this month. The panels are engraved with saints and angels, in a very bold scribbly style that nevertheless has a rich Gothic quality about it. We were very impressed, and also with his other work that he has at his studio – more glass work, but also paintings, and many other media as well. 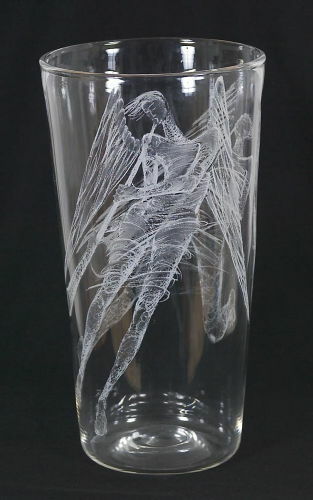 Just wish we had a hundred pounds to spare – he is making a series of vases, each engraved with two of the angels, which the cathedral is selling to raise funds. Revisiting this story feels particularly relevant today. From the window of my office at the Christchurch Press, I used to look out at ChristChurch Cathedral, which was destroyed in the earthquake of 2011. Arguments are still going on about whether to rebuild or replace a building that was the physical and spiritual center of the city. Godwits landing on the Motueka, NZ sandspit after their migration from Alaska. When asked why so many of us travel abroad, most Kiwis will respond that our birth country is a long way from anywhere and we want to see what the rest of the world looks like. The iconic image for such a journey is the godwit, a mottled brown wading bird with a long upturned bill that arrives around mid-September and spends the New Zealand summers foraging in mudflats and marshes. As the southern hemisphere air turns autumnal, godwits flock on sand spits and set off on their annual migration to another summer. They fly non-stop, nine thousand miles north to their breeding grounds in Alaska and Siberia. The mysterious compulsion for this incredible journey captured the imagination of early New Zealand writers. 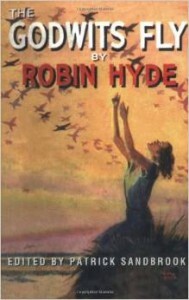 Robin Hyde, in her 1938 novel The Godwits Fly, first offered the metaphor: Most of us here are human godwits; our north is mostly England. Our youth, our best, our intelligent, brave and beautiful, must make the long migration, under a compulsion they hardly understand. The godwits vanish towards another summer. And in my clippings from The Press scrapbook is this advice column. The savings amounts I suggested are in New Zealand pounds, which were each worth US $1.40 in 1961. Even for the time, they were wildly optimistic, as we discovered when we arrived in London. Getting the interview was easy. The mother of race car driver (and later designer) Bruce McLaren was my Great-Aunt Ruth, whom had known since I was a kid. In January 1961 my cousin Bruce was back in New Zealand after an impressive debut on the Formula One circuit, where he had joined his mentor Jack Brabham on the Cooper racing team. In December of 1959, at the age of 22, he had become the youngest-ever winner of a Formula One race, capturing the U.S. Grand Prix at Sebring. He became a star overnight. Here is a Pathé newsreel clip from that race. The following year, Bruce came in second only to Brabham in the standings for the Formula One World Championship. Understandably, all New Zealand was agog. Knowing via family that Auntie Ruth and Uncle Les planned to be in town to act as staff for Bruce as he worked the New Zealand racing circuit, I arranged to visit them at their hotel. Perched on the bed with our cups of tea, my aunt and I settled in for a cosy chat. Auntie Ruth was a great raconteur, and since I already knew the family history, it took little prompting on my part for her to re-tell her best stories. 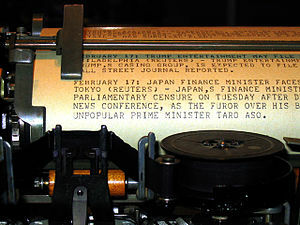 The interview ran much longer than usual, but the editors at The Press published it in full. The day it was published, almost all the men from the sports department and the general reporting pool stopped by the women’s department to congratulate me. “How on earth did you get that interview?” the sports editor asked. I just smiled. Bruce went on to establish Bruce McLaren Motor Racing Ltd. 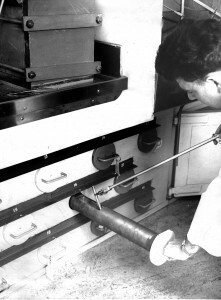 Unfortunately, in June 1970, he was killed while testing a McLaren CanAm car at his company’s site in England. His company lived on and today enjoys the reputation as one of the world’s foremost racing teams. Bruce was inducted into the International Motorsports Hall Of Fame in 1991. I’ve appended a transcription of the interview with Great-Aunt Ruth. 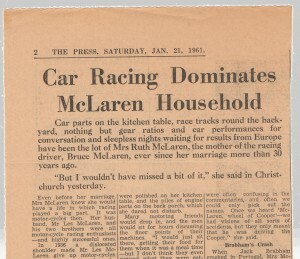 Car parts on the kitchen table, race tracks round the backyard, nothing but gear ratios and car performances for conversation and sleepless nights waiting for results from Europe have been the lot of Mrs Ruth McLaren, the mother of the racing driver Bruce McLaren, ever since her marriage more than 30 years ago. “But I wouldn’t have missed a bit of it,” she said in Christchurch yesterday. Even before her marriage, Mrs McLaren knew she would have a life in which racing played a big part. It was motor-cycles then. Her husband, Mr Les McLaren, and his two brothers were all motor-cycle racing enthusiasts – and highly successful ones. In 1936 a dislocated should made Mr Les McLaren give up motor-cycles. Two or three years later he became interested in racing cars. World War II ended all racing, but after the war Mr McLaren did a great deal of club work in hepolite trials and hill climbs. Bruce, aged eight at the time, was interested even then, and two years year, when he entered Wilson Home with a hip disease, he insisted on regular reports from his father. After Bruce came out of the home, at the age of 12, he spent 12 months with a hip sling and crutches. Football was out, much to his disappointment, but Mrs McLaren still found her share of muddy clothes to wash when Bruce and his father went on hill climbs and mud trials. Bruce’s first car was an Austin seven, which he acquired and “hotted up” at the age of 14. That was the end of Mrs McLaren’s garden. Too young for his driver’s licence, Bruce could not drive it on the roads, so he made a race track round the backyard and through the orchard. “No garden, and no branches left on the trees, either,” Mrs McLaren recalled. Every visitor to their Remuera home was initiated to the track, and had to endure a hair-raising and head-ducking ride round the course. When Bruce was 16 his father acquired an Austin Healey, which had something special about its engine. Although Mrs McLaren has picked up a great deal of motoring jargon, she cannot remember exactly what it was. All she remembers is the gloating and loving care with which the parts in question were polished on her kitchen table, and the piles of engine parts on the back porch, which she dared not disturb. 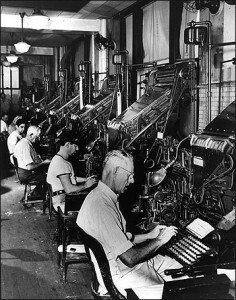 Many motoring friends would drop in, and the men would sit for hours discussing the finer points of their machines. “I would just sit there, getting their food for them when it was a meal time—but I don’t think they even noticed what they were eating,” said Mrs McLaren. By this time both Bruce and his father were driving the Austin Healey. There came a day when the son drove it faster than the father. that was the day when the father decided it was about time he quit. The news that Bruce had won the driver-to-Europe award caused great excitement in the McLaren household. Later, when he had gone, came the terrific strain of waiting for results. The McLarens waited anxiously for the first B.B.C. news in the morning, since the results of the championship races were always announced, and the news would come faster than a cable. Two seasons ago, Mr and Mrs McLaren went to Europe and followed Bruce around the championship circuit. “We had a wonderful time—the racing fraternity accepted us as one of themselves, and looked after us wonderfully,” said Mrs McLaren. During the races in New Zealand Mrs McLaren acts as lap scorer, but this was Mr McLaren’s job on the European tour. Mrs McLaren’s job was to stand by with wet towels and warm pullovers. With the wives of drivers and team managers, she would go shopping and sightseeing in the towns of Europe. “Usually someone in the party would speak the language, which helped a lot,” she said. Language difficulties often caused panics on the racing circuits. “The turns of phrase were often confusing in the commentaries, and often we could only pick out the names. Once we heard ‘McLaren, wheel of Cooper’—we had visions of all sorts of accidents, but they only meant that he was driving the Cooper,” she said. And the end they dashed across the track, jumped into Bruce’s car and to the hospital, where they found after much difficulty and confusion that Brabham was not hurt, but was being kept under observation. On another occasion in France, when the temperature was 96 degrees in the shade, and 136 degrees on the race track, Bruce came into the pits after the race badly cut with flying stones. 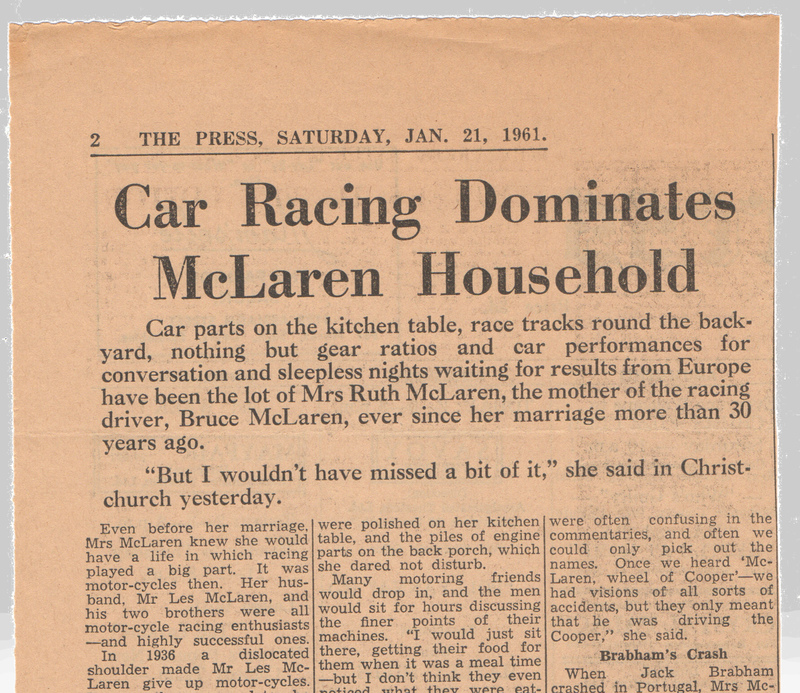 Now Mr and Mrs McLaren wait through the year for the few crowded weeks when Bruce is home. “It makes up for all the time he is away,” said Mrs McLaren. The house is always full of drivers and friends, and is besieged by young autograph hunters. “It’s very hectic, but very exciting. I wouldn’t miss it for anything,” said Mrs McLaren of her life as mother of a racing car driver. We were a subversive bunch in the Women’s Dept. 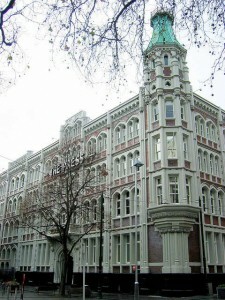 of The Press, Christchurch’s morning newspaper, even though the editorial stance of The Press was socially and politically conservative. 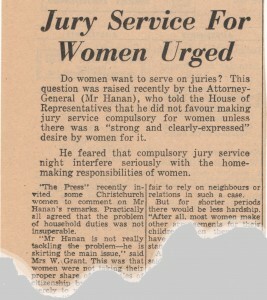 In the early 1960s a big issue for women was the right to serve on juries on an equal basis with men. Until 1942, New Zealand women were denied the right to sit on juries, and even after that date, they had to apply to have their names put on the rolls. 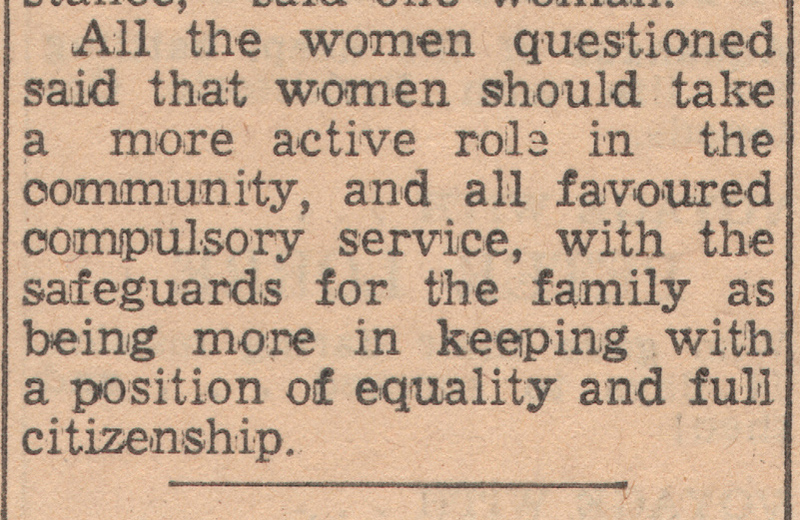 Only the most civic-minded women, referred to in some quarters as battleaxes and stickybeaks, volunteered to do so. 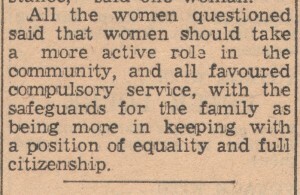 The official view was that compulsory jury service might interfere seriously with the home-making responsibilities of women. 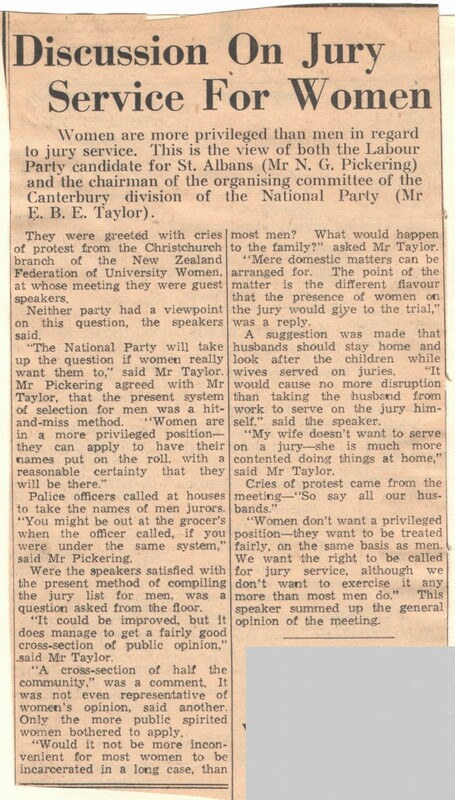 I remember the glee with which I returned to the office from a meeting of the Christchurch branch of the New Zealand Federation of University Women and regaled my colleagues with the drubbing the guest speakers, two male politicians, received concerning this attitude. 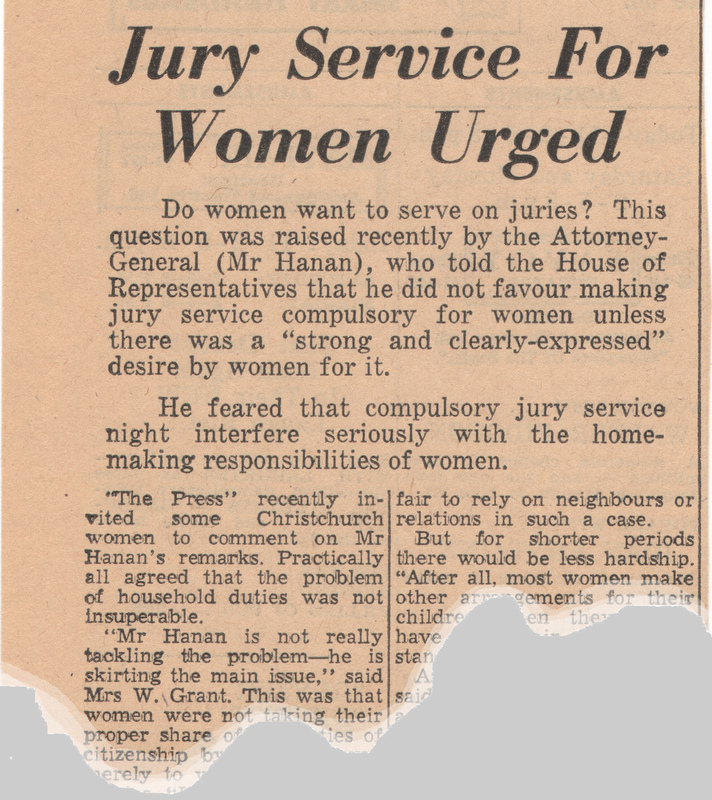 A petition to Parliament in 1963 resulted in a compromise: the Juries Amendment Act of 1963 made women liable to be included in the roll in the same way as men, but gave a woman an absolute right to have her name withdrawn on request. This right was cancelled in 1976. Jury service for men and women then became completely equal. NOTE: The issue of jury service for women in the United States followed a similar trajectory, though complicated by variations among states. In 1979 (three years after New Zealand) the U.S. Supreme Court overturned automatic exemptions for women. 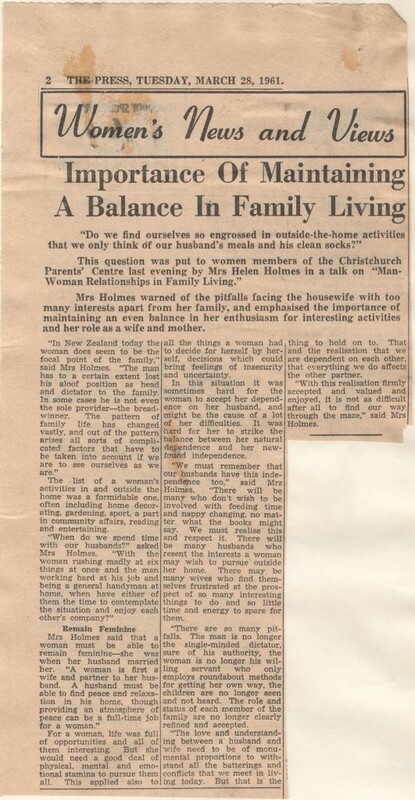 New Zealand social mores were clear when I was growing up in the 1940s and ‘50s: a woman’s place was in the home, taking care of husband and children. A few women (like my mother-in-law) worked after they had children, but the job options were few. The staff at Christchurch’s The Press newspaper was overwhelmingly male. 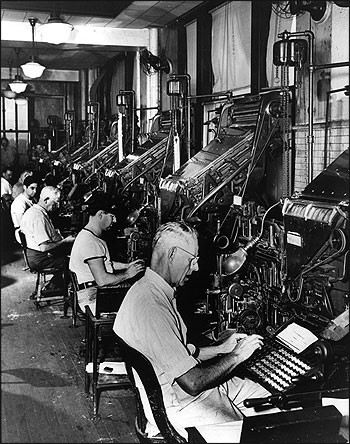 When I started in 1960, there was only one other woman reporter, besides myself, in the general reporting pool. 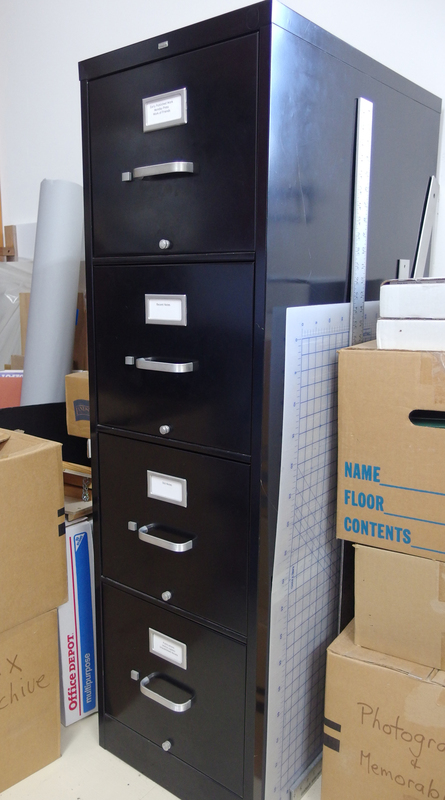 A vacancy occurred in the Women’s Department, secluded in a separate little office down the hall. The other woman reporter, older and wiser about gender issues, adamantly refused to take it. I didn’t want to go either. I was having a ball scouring the big city hotels for interesting overseas visitors, interviewing artists, musicians and others with fascinating careers and histories. But I was not given a choice. 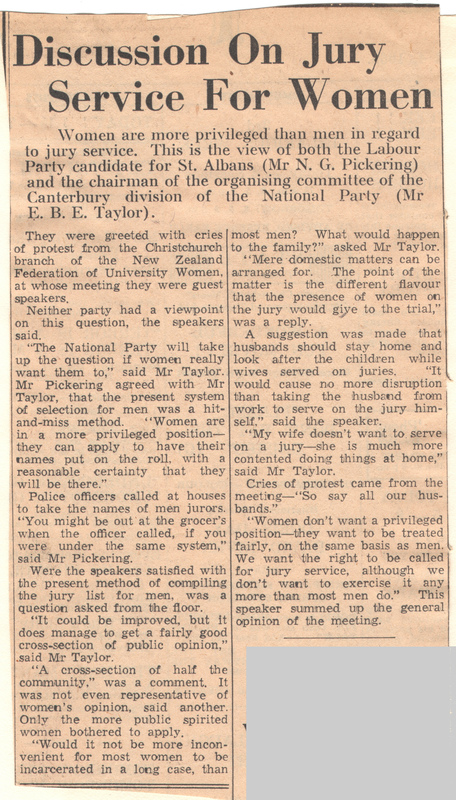 Fortunately the women’s page editor, Tui Thomas, was sympathetic to my lack of interest in fashion and the social scene, and set me to reporting on meetings of various organizations focused on women and families. I cringed when I first re-read this clipping from my scrapbook, with its sexist stereotypes. Looking more carefully, I sense the speaker’s unease. By the early 1960s, change was in the air. I don’t remember who Mrs Holmes was, but I imagine her as an older woman struggling to reconcile traditional values with the emerging demand by a younger generation of women for an expanded role in the world outside the home. I’ve appended a transcription, in case you have trouble reading the old newsprint. Mrs Holmes warned of the pitfalls facing the housewife with too many interests apart from her family, and emphasized the importance of maintaining an even balance in her enthusiasm for interesting activities and her role as a wife and mother. The list of a woman’s activities in and outside the home was a formidable one, often including home decorating, gardening, sport, a part in community affairs, reading and entertaining. For a woman, life was full of opportunities and all of them interesting. But she would need a good deal of physical, mental and emotional stamina to pursue them all. This applied also to all the things a woman had to decide for herself, by herself, decisions which could bring feelings of insecurity and uncertainty. In this situation, it was sometimes hard for the woman to accept her dependence on her husband, and might be the cause of a lot of her difficulties. It was hard for her to strike the balance between her natural dependence and her new-found independence. “We must remember that our husbands have this independence too,” said Mrs Holmes. “There will be many who don’t wish to be involved with feeding time and nappy changing, no matter what the books might say. We must realize this and respect it. There will be many husbands who resent the interests a woman may wish to pursue outside her home. there may be many wives who find themselves frustrated at the prospect of so many interesting things to do and so little time and energy to spare for them. “There are so many pitfalls. The man is no longer the single-minded dictator, sure of his authority, the woman is no longer his willing servant who only employs roundabout methods for getting her own way, the children are no longer seen and not heard. The role and status of each member of the family are no longer clearly defined and accepted.